A sample unit was sent to me for an independent evaluation, and now I can't stop laminating things! This is a simple and sleek device, and extremely easy to use. It has performed flawlessly for me from first to last page even when in use for half an hour at a time. The instructions are clear enough and the only thing to consider is the warm-up time. Laminating pouches are available in different sizes and thicknesses, so it's important to let the laminator achieve the correct temperature for the pockets you have. Basically, all you need to do is plug the laminator into a handy wall outlet (the lead measures about 1.40 m but I have used it successfully with an extension cord) and turn it on, using the switch at the front. A red light confirms that power is on. After three to five minutes, a green spy also lights up, indicating that the laminator has reached operating temperature for 75 micron pouches. I bought a box of 100 Fellowes sleeves rated 80 microns, so I wait an additional minute before starting to laminate. You then position your document, photo or other item inside the sleeve, aligning it as necessary, smooth the top flap close and feed the pouch in the front slot of the laminator, closed-end first (Fellowes pouches have a convenient disappearing arrow). Once the top edge has reached the mid-point inside the slot, the roller gently starts rotating, taking the pouch along. Leave it to move through without interference and remove it from the back, once the page has stopped moving. That's all there is to it. Should a jam occur, there is a release button to press at the back, while you pull the sleeve out from the feeding (front) end. I have not tested this as the laminator has never jammed, or even looked likely to do so, but I imagine feeding the pouch starting with the open end might cause problems. I had a number of irreplaceable photos from many years ago, in danger of fading and getting scratched. The negatives have been lost, or were never in my possession, so in each case this one precious print is all I have. It's possible to scan most photos, but often the resulting print is not of the same quality as the original, so laminating is my preferred option. The final results are impeccable. I have laminated over 30 pages so far, and they have all come out perfectly even, with no air bubbles, creases or other imperfections. A lovely surprise is that the colours and the contrast of the original are always improved and the photos really come alive. As well as protecting the contents, laminating makes things rigid. I have used it for favourite recipes, inspiring magazine pages and also musical scales, so that the paper sits firmly on the keyboard stand as I struggle to practise. I am delighted with this simple but effective addition to my home office. It's the sort of things that you will find new uses for, once you have it at home. I have owned scanners for 14 years now and consider them absolutely essential. 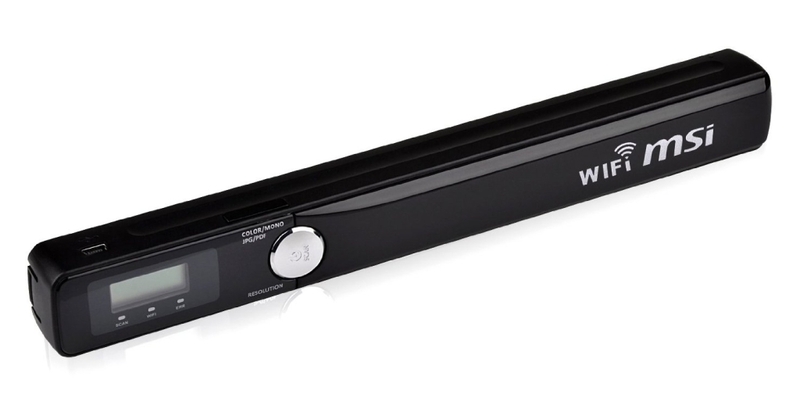 My current one is a multi-purpose printer, copier, scanner combo, so when I was offered this portable, wand-style scanner to test and review, my first thought was: who would need one of these? A couple of weeks after taking this small MSI scanner out of the box, I think almost anyone could use one. It comes with an 8GB memory card, USB cable, instructions in English, a software CD, cleaning cloth and a very useful protective sleeve with drawstrings (with a bit of a chemical smell so that a little airing was needed). The obvious applications are to copy business and legal documents, pages out of books, receipts and invoices while on the go, however, once you have one of these in your bag or briefcase, your imagination will be stimulated. I was shopping the other day and by pure chance saw a remnant of some beautiful fabric for sale. I scanned the fabric, emailed the photo to my home computer and my husband confirmed that it looked great next to the sofa. I bought the fabric on the spot before someone else did. I have used this scanner to copy recipes and photos when visiting an elderly relative who does not have a computer and, of course, it's great if you are doing research at the library and don't want to queue up for the photocopier. I find it most useful to scan directly to the memory card using 3 AA rechargeable batteries (not included) and later downloading to my computer via the USB cable. Scanning is really easy and intuitive, going slow and letting the little rollers glide over whatever (flat) object you wish to copy. Getting started took a little time. The instructions are difficult to read and not entirely clear. Formatting the card requires something like a ballpoint pen and I had to push really hard to activate the button. I then used the same system (and strong approach) to set the date and time on the right before closing the top of the scanner. The software does not work with Windows 8 (as I found out) but is compatible with Vista and Win 7. Even without software, my laptop was able to download the files from the memory card by way of the USB cable or wirelessly. 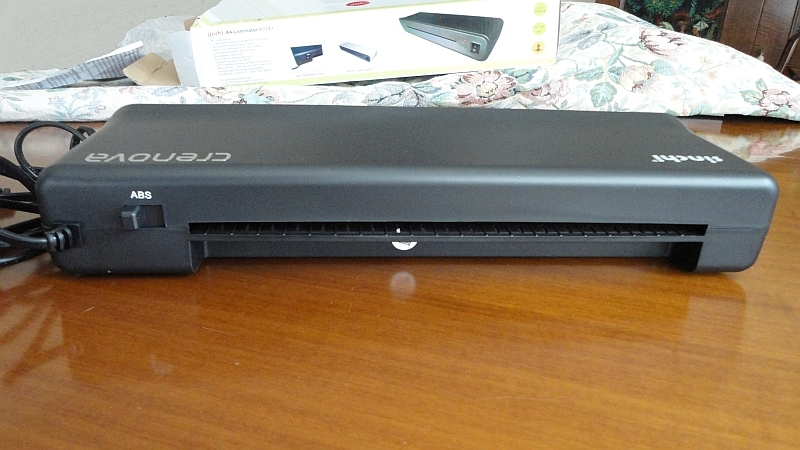 All in all, this is a sturdy, very portable scanner which produces great scans in JPG and PDF format, B&W or colour. I was surprised at the quality of the images. 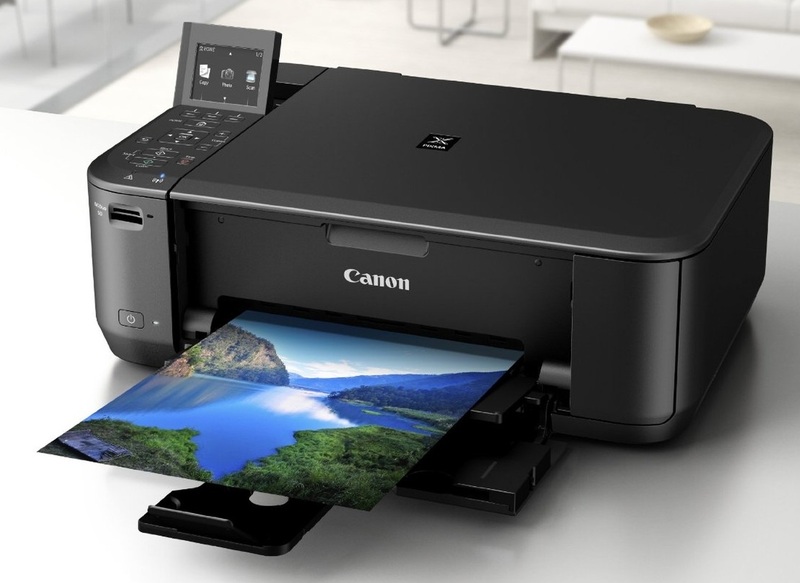 This is my first Canon printer. I previously had two different Lexmark models (which are still sort-of working after respectively 13 and 9 years but the cartridges are way too expensive) and lately an HP which gave up the ghost after “only” 5 years, failed to impress when in its prime and drove me mad rejecting new cartridges after only a few days. After a month of daily use, I'm really pleased with my PIXMA! It was easy to set up (although I cannot comment on the WiFi connection as I have not needed it yet, using instead my old USB cable). The software included works well and is fairly intuitive to use. I like the closed design which keeps dust out and the clever duplex function for automatically printing double-sided documents. There are so many options, like booklet printing, which used to be a pain to set up manually. The original cartridges are still half full, despite daily use and some intensive, full-page colour print jobs, and the ink does not smudge. I love the ability to copy with just the on-board screen and buttons and the option to print photos directly from a memory card, although for scanning, I prefer to use the pc interface. A quality multifunction printer which has exceeded my expectations. UPDATE: After seven months of almost daily use, I am really delighted with my PIXMA. The original black cartridge included with the printer lasted me four months and the colour one a little over five months. Apart from the economy of use, I'm amazed that the ink stayed fresh all that time. Also the print program alerts you when ink is low but, since this is an estimate based on page count, often you can keep going for ages after the nag messages start. The really good feature is that the printer continues to print despite the warning until print quality deteriorates. With my previous printers, once the cartridge was deemed empty, it would stop working and I frequently had to replace cartridges which still had lots of ink inside. The copy feature is super easy and I'm most impressed with the scanner. I have a lot of old photos, taken with a 35mm camera, that I have been scanning to save in digital format and the quality is superb.